Here in British Columbia fishing is without a doubt a very popular outdoor activity, perhaps the most popular outdoor activity overall. This did not happen by sheer chance. Sure, we are fortunate in this province to have an abundance of publicly accessible lakes, ponds, streams and rivers covering a total of 19,549 square kilometers of our total landmass. 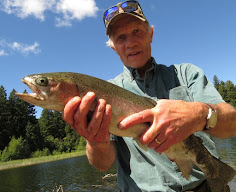 The real reason why fishing has become such a popular activity is largely due to the efforts put forth by the Freshwater Fisheries Society of BC (FFSBC) in the conservation of the fishery and the promotion of the fishing sport. Each year the FFSBC stocks thousands of lakes across BC (over 100 lakes alone in the Thomson-Nicola region) with millions of trout. 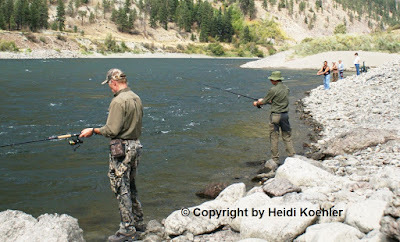 In addition the society stocks many rivers with millions of steelhead. Where do these fish stocks come from? The FFSBC raises over eight million fish annually in six fish hatcheries owned by the society in Duncan, Abbotsford, Summerland, Clearwater, Fort Steele and Vanderhoof. The fish eggs are collected from wild stocks in nine egg collection stations situated throughout the province. The fish eggs are then distributed among the society owned hatcheries. When the fish reach a size that permits them to survive in the wild they are transported in specially outfitted tank trucks to the various lakes and ponds in our province and released. The money for this large scale operation comes from the licence sale of the 270,000 recreational anglers to the tune of 10 million dollars and though partnerships with other organizations and commercial sponsors. Raising hatchery fish and stocking lakes and rivers with fish is one aspect of the society. The Freshwater Fisheries Society of BC also undertakes critical and widespread work and research on fish conservation and habitat programs. Some may ask “Why stock fish for the purpose of fishing?” The answer to that question is quite simple. Stocking fish goes a very long way towards accommodating recreational anglers who contribute 546 million dollars to the provincial economy and more importantly, it eases the pressure on our wild fish stocks. With such an abundance of fish available through this work the needs of all anglers can be met. The Freshwater Fisheries Society of BC gets support in the promotion of the fishing sport from the hundreds of clubs across our province. Locally, the Nicola Valley Fish and Game Club in Merritt organize FFSBC events such as the “Learn Fishing” and “Fishing the City” programs that are an integral part in educating people about fishing and fish conservation while attracting new and young anglers to this family orientated outdoor activity.